tux and Gown Butter mints. Each Individual wrapper contains 1 butter mint. (Approx. 120 pieces. /unit) Total wt., 1 lb. Fat-free. Thank You Message Butter mints. Each Individual wrapper contains 1 butter mint. (Approx. 120 pieces. /unit) Total wt., 1 lb. Fat-free. Wording: Thank you for sharing our special day. It's A Boy Butter mints. Each Individual wrapper contains 1 butter mint. (Approx. 120 pieces. /unit) Total wt., 1 lb. Fat-free. It's A Girl Butter mints. Each Individual wrapper contains 1 butter mint. (Approx. 120 pieces. /unit) Total wt., 1 lb. Fat-free. Graduation Butter mints. Each Individual wrapper contains 1 butter mint. (Approx. 120 pieces. /unit) Total wt., 1 lb. Fat-free. 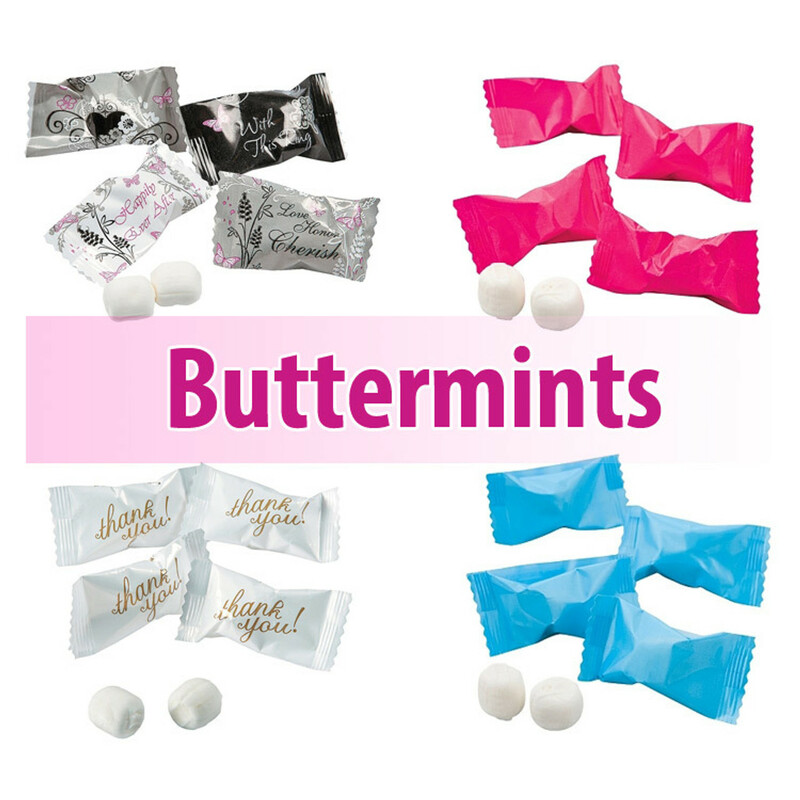 Hot Pink Butter mints 120 pieces. Each Individual wrapper contains 1 butter mint. (Approx. 120 pieces. /unit) Total wt., 1 lb. Fat-free. Purple Butter mints 120 pieces. Each Individual wrapper contains 1 butter mint. (Approx. 120 pieces. /unit) Total wt., 1 lb. Fat-free. Pink& Butter mints 120 pieces. Each Individual wrapper contains 1 butter mint. (Approx. 120 pieces. /unit) Total wt., 1 lb. Fat-free. Light Blue Butter mints 120 pieces. Each Individual wrapper contains 1 butter mint. (Approx. 120 pieces. /unit) Total wt., 1 lb. Fat-free. Mr. and Mrs. Butter mints. Each Individual wrapper contains 1 butter mint. (Approx. 120 pieces. /unit) Total wt., 1 lb. Fat-free.